Geo-Market Surveys are designed to better understand the needs, wants, and shopping behaviors of people that live and/or work within the geographic market area surrounding a particular site - usually the location of a retail store or service. The exact boundaries of the market area may be quite large or quite small depending on the service (and from how far it can draw customers), the location of competitors, the configurations of roads and transit services, and natural boundaries. For example, a neighborhood grocer may have a market area of 2-3 miles, while a warehouse store may have a market area of 20 miles or more. 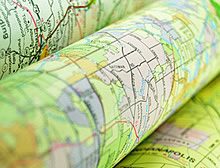 Geo-Market Surveys may be conducted as part of a feasibility study. The survey can describe the demographic and lifestyle characteristics and shopping patterns of people within that marketplace. A Geo-Market Survey can also identify the types of retail tenants and services residents would like to see in their neighborhood. For business owners or commercial property developers looking to remodel a property (restaurant, grocery store, shopping center, etc. ), a Geo-Market Survey can assess how well a concept, design, or particular service will be accepted and how a concept can be modified in order to be more successful. For example, some years back we had client whose restaurant did a very prosperous evening business, but was mostly empty during the lunch hour, even though the site was located within a busy commercial office district. The client planned to remodel the space and redesign the menu with the goal of increasing his lunch trade. We surveyed potential lunch customers within the district to identify how often they eat lunch in a restaurant, the type of food they eat, what they spend, and their preferences across a broad spectrum of food, decor, and atmosphere elements. We were able to provide the owner with the menu, price, and atmosphere profile of his most likely new lunch customers. He was able to use this profile as design parameters for the remodel and new menu. The Geo-Market Survey can also measure market share of various retail stores within a market area. For the retailer, it can be used to evaluate all aspects of the store and shopping experience compared to competitors in order to identify where the competition is having the greatest impact on market share. For a public facility, such as a park, a Geo-Market Survey becomes a Public Opinion Survey in a relatively small area. Planners can find out who uses the facility, which amenities they use or don’t use, and what they can do to make the facility better fit the needs of local residents.